Amid a haze of grief after her son’s murder last year, Marcia DeOliveira-Longinetti faced an endless list of tasks — helping the police access Kevin’s phone and email, canceling his subscriptions, credit cards and bank accounts, and arranging his burial in New Jersey. And then there were his college loans. When DeOliveira-Longinetti called about his federal loans, an administrator offered condolences and assured her the remaining balance would be written off. But the grieving mother got a far different response from a New Jersey state agency that had also lent her son money to pursue education. “Please accept our condolences on your loss,” said a letter from the Higher Education Student Assistance Authority to DeOliveira-Longinetti, who had co-signed the loans. But her experience with the authority, which runs by far the largest state-based student loan program in the country, is hardly an isolated one, an investigation by ProPublica, in collaboration with the New York Times, found. New Jersey’s loans, which currently total $1.9 billion, are unlike those of any other government lending program for students in the country. They come with extraordinarily stringent rules that can easily lead to financial ruin. Repayments cannot be adjusted based on income, and borrowers who are unemployed or facing other financial hardships are given few breaks. New Jersey’s loans also carry higher interest rates than similar federal programs. Most significantly, the loans come with a cudgel that even the most predatory for-profit players cannot wield: the power of the state. New Jersey can garnish wages, rescind state income tax refunds, revoke professional licenses, even take away lottery winnings — all without having to get court approval. The authority has become even more aggressive in recent years. Interviews with dozens of borrowers, who were among the tens of thousands who have turned to the program, show how the loans have unraveled lives. The program’s regulations have destroyed families’ credit and forced them to forfeit their salaries. 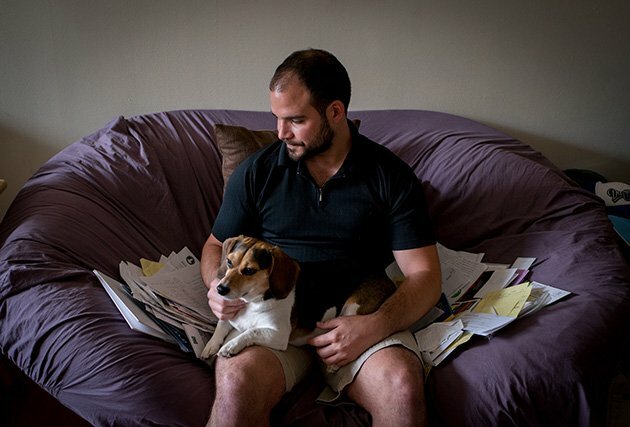 One college graduate declared bankruptcy at age 26 after struggling to repay his debt. The agency filed four simultaneous lawsuits against a 31-year-old paralegal after she fell behind on her payments. Another borrower, Chris Gonzalez, couldn’t keep up with his loans after he got non-Hodgkin’s lymphoma and was laid off by Goldman Sachs. While the federal government allowed him to suspend his payments because of hardship, New Jersey sued him, seeking nearly $266,000 in payments, and seized a state tax refund he was owed. One reason for the aggressive tactics is that the state depends on Wall Street investors to finance student loans through tax-exempt bonds and needs to satisfy those investors by keeping losses to a minimum. Loan revenues also cover about half of the agency’s administrative budget. The cases are handled by debt collectors, who can tack on another 30 percent in fees on top of the outstanding debt. A spokesman for Gov. Chris Christie said the governor does not control the authority and declined to respond to questions about the loan program. But Christie appointed its executive director, Gabrielle Charette; he also has the power to appoint at least 12 of the agency’s 18 board members and can veto any action taken by the board. Tax returns released by Christie show he and his wife had annual income of around $1 million in recent years. Besides administering the loan program, the authority provides financial aid counseling, conducting hundreds of financial aid nights at New Jersey high schools, where it offers advice about paying for college, including pitching its own loans. DeOliveira-Longinetti, who emigrated from Brazil and had long worked as a nanny while raising her son as a single mother, always knew that paying for college would be a challenge. Even after marrying her husband when Kevin was in middle school, she knew that their combined income would not be enough to cover the costs. But a friend told her about New Jersey’s program. That, along with a combination of scholarships, grants, and other loans, allowed Kevin to enroll at the University of Vermont. Since her son’s murder, DeOliveira-Longinetti has made 18 payments to New Jersey. At $180 per month, she has about 92 to go. For decades, states served as middlemen for federal student loans. Most of the loans were made by banks and were handled and backed by regional and state-based agencies as well as by the federal government. The arrangement was unwieldy, expensive and marked by scandal. After Pennsylvania’s student loan agency lost a public records lawsuit in 2007, documents revealed that the agency had spent nearly $1 million on things like fly-fishing, facials and falconry lessons. In 2010, Congress and the Obama administration decided to effectively eliminate the role of state agencies by having only the federal government lend directly to students. Some states, like California, decided to downsize and transferred their federal loan portfolios. Others, such as Pennsylvania, won contracts from the federal government to service debt from the federal loan program. But New Jersey chose a different path. In the years leading up to the end of the federal program, New Jersey sharply expanded its loan program, slowly replacing the federal loans it once handled with state loans. From 2005 to 2010, loans from the agency nearly tripled, to $343 million per year. Since then, the agency has reduced its loans by half, but its outstanding portfolio has remained roughly the same, about $2 billion. US Senator Bernie Sanders proposed that all public colleges and universities offer free public education, with tuition costs funded by a tax on Wall Street transactions. Karrow said the growth of New Jersey’s program was simply a result of both the growing number of students and the rising cost of tuition. But in fact, college enrollment and tuition have not grown as rapidly as the program’s size. While other states have similar programs, New Jersey’s stands apart, both for its size and onerous terms. Massachusetts, running the next-largest program with $1.3 billion in outstanding loans, automatically cancels debt if a borrower dies or becomes disabled, something many other states also do. The program of the third-largest state lender, Texas, is half the size of New Jersey’s. And Texas offers a flat interest rate, a modest 4.5 percent, while New Jersey’s rates can reach nearly 8 percent. Some other state loan programs also have more flexible repayment options — Rhode Island, for example, offers income-based repayment. Indeed, in a recent bond assessment, the credit rating agency Moody’s cited the authority’s “administrative wage garnishing, which it uses aggressively” for “significantly higher collections” compared with other programs. A New Jersey rule adopted in 1998 allows the agency to give borrowers in default a second chance by allowing them to become current on their account through on-time payments. But the agency has never granted a reprieve and instead cuts off contact with borrowers, leaving them at the mercy of collection firms. Karrow said federal regulations prohibited the agency from offering such relief, but student loan experts disputed that assertion. “There is nothing in the federal law or regulations that prohibits them from offering private loan rehabilitation,” said Mark Kantrowitz, a financial-aid expert. Given the lack of options, some New Jersey borrowers have resorted to declaring bankruptcy, even though, as is true of all student loans, their debt is rarely canceled. Declaring bankruptcy also makes it virtually impossible to secure a mortgage, lease a car or even use credit cards for years. But for New Jersey borrowers, such an extreme step at least offers a way to gain manageable monthly payment terms. As a co-signer, Tracey Timony struggled to help pay off her daughter’s $140,000 in loans. Though the Higher Education Student Assistance Authority can seize wages or tax returns without court approval, it must secure a judgment to dip into borrowers’ bank accounts or place liens on their property. Instead of garnishing Timony’s wages, New Jersey sued her after her daughter defaulted. Timony declared bankruptcy and got monthly debt payments that will rise no higher than about $1,000 a month, far less than what the agency had demanded. “I never thought that sending my daughter to college would ruin our lives,” Timony said. Few have felt the weight of the agency’s powers more than Gonzalez, the college graduate who was sued after receiving a diagnosis of cancer and losing his job. He had borrowed the maximum he could in federal loans — a total of about $30,000 for five years — and paid for most of his tuition with loans from New Jersey. Over five years, he took out over $180,000 in state loans. Unlike most other states, New Jersey does not impose a strict cap on loans to discourage overborrowing. One family, according to a recent state audit of the agency, took out over $800,000 in loans, more than five times the value of their home. Gonzalez’s loans had a relatively high interest rate — on average about 7.5 percent. At the time it seemed like a good investment. He graduated with an engineering degree from Embry-Riddle Aeronautical University in Florida and landed a job on Wall Street working as a programmer for Goldman Sachs. But a few months after he started, unusual rashes began to appear on his legs and underarms. He was diagnosed with non-Hodgkin’s lymphoma and started radiation therapy. After three years of cancer treatments, Gonzalez was also laid off. He needed to take care of his student loans. The federal government and his private lenders all deferred his debt for at least six months. Gonzalez expected New Jersey to do the same, but the agency refused, requiring him to pay at least $500 a month. With unemployment checks as his only income and burdened by continuing health expenses, it was too much for him. He made no payments while the agency reviewed his case. In June 2014, Gonzalez moved to Florida to lower his cost of living. His health slowly improved and he started his own company, developing technology for small businesses. In his first year, he made just $26,000, but he started to pay back his federal and private bank loans. On May 8, 2015, after months of hearing nothing, he received an email from New Jersey: His deferral request had been denied and his loan was being sent to a collection agency. “Unfortunately, because of how the loan originated, the Authority is not in a position to offer forbearance or relief,” Robert Laird, a program officer at the loan agency, said in the email. Terrified by what a default would mean for his credit rating, Gonzalez told the agency that he would stop paying for health insurance and use the money — $200 per month — to repay the loans. The agency rejected the offer. “In the event that your doctor declares you total and permanently disabled, please keep me posted,” Laird told Gonzalez in an email. One day in April, a stranger rang Gonzalez’s doorbell. The suit demanded over $260,000 — about $188,000 for the original loans, nearly $34,000 in interest, and $44,000 to cover the fees of a collection agency’s lawyer. Even if his business improves, Gonzalez has no idea how he will afford his ballooning payments.